For some, caramel corn may bring back childhood memories of attending a county fair, baseball game, or carnival. 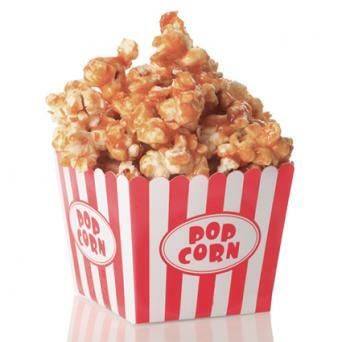 For others, it is simply a great popcorn snack to munch on while watching a movie. Fortunately, caramel corn doesn't need to wait for a special occasion -- make it tonight on the stove or in the microwave! For an added salty crunch, stir one cup of roasted peanuts into the caramel corn mixture before baking. The recipe makes four quarts. Grease a large cookie sheet, or spray with non-stick cooking spray. Place popcorn on the cookie sheet. Combine brown sugar, corn syrup, salt, and butter in a large saucepan that has been placed over medium heat, and stir constantly. Allow mixture to come to a boil, and cook for five minutes, without stirring. Add baking soda and vanilla to saucepan, and stir well. Pour caramel sauce over popcorn, and toss with metal tongs to coat evenly. Bake popcorn for 45 to 50 minutes, stirring occasionally. Once caramel corn is completely cool, break into bite-sized pieces. Store in an air-tight container for up to one week. Only have a few minutes to spare in the kitchen? This tasty caramel corn is made in the microwave! The recipe makes four quarts. Place popcorn in a large mixing bowl. Combine brown sugar, butter, corn syrup, and salt in a microwave safe bowl. Cook brown sugar mixture at high heat in the microwave for at least two minutes, or until it comes to a boil. Remove bowl from the microwave. Stir vanilla into caramel mixture. Stir baking soda into caramel mixture. Carefully pour caramel mixture over popcorn, and toss with metal tongs until thoroughly coated. Place bowl back in microwave, and cook at high heat for 90 seconds. Remove bowl from microwave, and toss carefully with metal tongs. Repeat steps 8 and 9 once more. Pour caramel corn onto a cookie sheet, and allow to cool completely. Candy making can be a daunting process -- especially when it comes to cooking sugar or syrup to a specific temperature. Fortunately, caramel corn -- a delicious snack or dessert -- is fairly fool-proof and can be made on the stovetop with ease. For the more tentative chef, consider the use of your microwave the next time a caramel corn craving kicks in. You'll be crunching away in a matter of minutes!